Root canal treatment — also called endodontics (“endo” – inside, “dont” – tooth) — is a set of specialized procedures designed to treat problems of the soft pulp (nerve) tissue inside the tooth. While some mistakenly think of it as an unusually painful treatment, in most cases the procedure is no more uncomfortable than getting a filling. It's actually one of the most effective ways of relieving some kinds of tooth pain. A root canal procedure becomes necessary when infection or inflammation develops in the pulp tissue of the tooth. Pulp tissue consists of blood vessels, connective tissue and nerve cells — which explains why a problem here may cause you to feel intense pain. In time, the pain may go away... at least temporarily. Without treatment, however, the infection won't. It can lead to a dental abscess, and may even contribute to systemic problems in other parts of the body. We've all heard the gag: “I'd rather have a root canal...” This comedy line, comparing the procedure to something truly undesirable, may be funny — but putting off needed endodontic treatment is no joke. The idea that a root canal procedure invariably comes with complications and pain is a shopworn myth. It's certainly true that infection or inflammation in the tooth's pulp can be excruciatingly painful. But you should remember that having a root canal results in eliminating this acute pain and is not the cause of the pain. Need another reason not to delay root canal treatment? How about this: A natural tooth that's saved via root canal treatment and restoration helps you avoid the problems that commonly occur when teeth must be removed. These include unwanted tooth migration or shifting, which can lead to difficulties in chewing; the need for bridgework or dental implants, which may be costly and complicated; and even the eventual loss of bone structure from the area of the missing tooth. 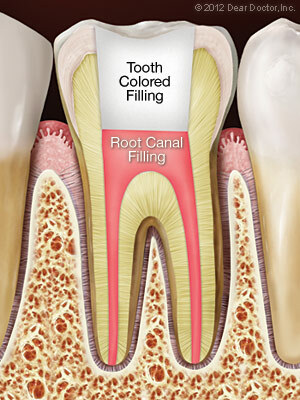 Root canal problems stem from infection and inflammation of the tooth's pulp tissue. 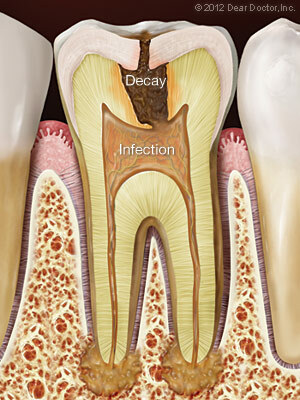 One potential cause of infection is deep tooth decay. Untreated dental cavities eventually allow bacteria to work their way down to the center of the tooth, where they may infect the pulp tissue. 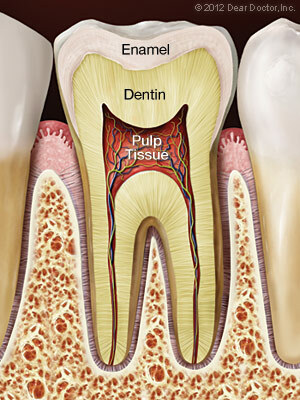 Another path by which bacteria may come into contact with pulp is via chipped or cracked teeth. Any opening in the protective enamel coating has the potential to allow bacteria access to the tooth's pulp. Trauma to the tooth — the kind that might result from a sports injury or automobile accident, for example — is also a major cause of pulp tissue damage. In this case, it's essential to seek treatment immediately, both to try and save the tooth, and to prevent future problems. If an examination shows that you do need root canal therapy, don't worry — it's one of the most routine and effective procedures in the arsenal of dental treatments and can often be accomplished in just one visit. The root canal process generally begins the same way as a filling does, and with no greater discomfort: an anesthetic is administered to numb the tooth and the surrounding area. For many patients, the worst is already over. To further protect the tooth and restore it to full function, it's usually necessary to have a crown or other restoration placed on it. Restorations can take many forms, from traditional gold crowns to tooth replicas made of high-tech tooth-colored material. In any case, you will have made an investment in preserving your dental health for years to come. How do you know when you need a root canal? Sometimes, it's painfully obvious. If you feel constant and severe pain and pressure in your mouth, or noticeable swelling and extreme sensitivity in your gums, then it's clear you need an evaluation and treatment right away. Another telltale symptom of pulp tissue damage is sharp pain when you bite down on food. Lingering pain after eating hot or cold foods is also an indication of potential trouble. If you notice any of these symptoms, you need to have an examination as soon as possible.